Step 1: FREE Home Inspection. We'll unravel the mysteries of how to get Wifi signal into every nook and cranny of your home. Our friendly technicians will install all equipment and assist in connecting every device. Step 3: Advanced 24/7 Wifi Support. Get unlimited assistance with everything from setting up a new Smart TV, to remote trouble-shooting/repair of signal strength. We're here to solve all your wireless headaches for FREE. Sit back and relax! We'll ensure your equipment is always up-to-date and working like it should. Enjoy complete peace of mind with guaranteed no-cost replacement for defective* or out-dated* equipment. 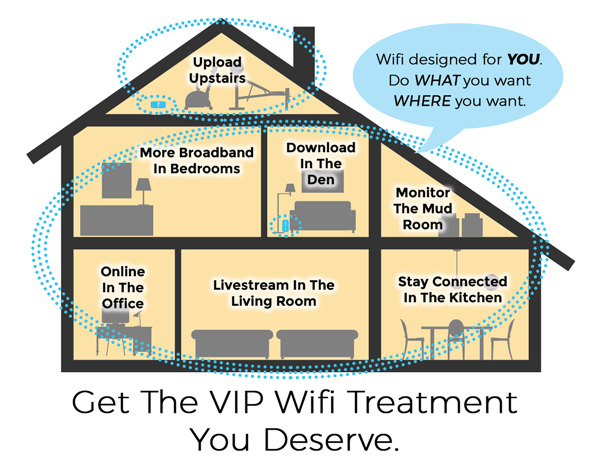 Ready to get the VIP Wifi Treatment You Deserve? I'm ready for VIP Service. Sign Me Up! Defective Equipment: You are responsible for the safe keeping of network equipment. ATC has no responsibility for replacing equipment destroyed or damaged by misuse, abuse, or neglect. If ATC determines the equipment to be defective, ATC will either repair or replace the defective equipment. Limited to one equipment replacement per calendar year. Out-Dated Equipment: ATC will make all reasonable efforts to replace outdated equipment with newer models at no cost to the subscriber. The decision to replace outdated equipment rests solely with ATC. Cancellation: You may cancel your VIP Wifi subscription after 90 days. Cancellations before 90 days will result in a $60 early termination fee. ATC reserves the right to cancel or change the terms/pricing of this program without notice. In the event you cancel your subscription to this program, or if the program is canceled by ATC, you must return all equipment to ATC during regular business hours and within 10 days of cancellation or termination of service. If equipment has not been returned to ATC within 10 days, you may be charged the full cost of all unreturned equipment.